At the best of times, parenting can feel like an unrelenting dance, a high-stakes, best-guess endeavor that alternately fills us with towering pride and cowering self-doubt. If you’re lucky enough to have a loving co-parent, enough money, good health and decent parents yourself, your dance may be a waltz. But for many of us, parenting can feel more like a tricky two-step. What we need for survival is self-forgiveness, a little comfort and a good sense of humor. I was sorely in need of all three when I first discovered Gilmore Girls more than 10 years ago. Left breathless and reeling from divorce, I found myself a single mother of two. The kids and I retreated to a teeny rental house and began to reinvent our family, finding comfort in new routines. My son, then 8, needed togetherness and simple busy-ness. We spent hours in the “invention center,” taping tubes together to build time machines. My daughter, 11, needed togetherness and escape. We crawled under blankets and binge-watched Gilmore Girls. We escaped to a tiny, beautiful New England village, with a bustling town square and a diner where everyone knows your name. It’s a simpler world, and a kinder one. Political differences are peacefully settled in the town hall, and everyone has enough money (hey, this is escapist fiction). Even the town weirdos are regarded with fond tolerance; really scary stuff never enters into it. It’s like a warm, comforting hug, a sepia-washed West Elm update of the Waltons. It’s total make-believe. It’s fun and it’s funny. It’s a safe place. Lorelai seemed to cast all of my parenting shortcomings in a new and positive light, legitimizing my fierce, extremely imperfect mothering. For me, it was also a validating place. I was holding it all together the best I could, but my mothering didn’t look much like anyone else’s — until I saw this show. Like me, Lorelai Gilmore is a culturally voracious, irreverent single mom with an absent ex and a serenely bookish — and undeniably thriving — mini-me. Lorelai seemed to cast all of my parenting shortcomings in a new and positive light, legitimizing my fierce, extremely imperfect mothering. Her bond with her daughter is the stuff of dreams — the best-ever on TV — despite her oddball sister-mothering style (or because of it). Lorelai’s fashion and junk-food addictions made my “waffles for dinner” nights and thrift-store runs seem less a cop-out and more a bonding opp. Likewise, my sister-mom lapses, arguing with my daughter over whose turn it was for the Uggs or the flat iron, and my embarrassing passion for throwback hip-hop. It all finally had a frame that made sense. Our family was different from the others at my kids’ small elementary school, but our differences now seemed survivable, even cool. “You’re not like other moms,” my daughter told me more than once, and what was once a source of deep-seated anxiety became a source of pride. We made a virtue out of painful necessity. It seemed the best sort of victory. Lorelai, flawed as she is, is more than enough Mom for Rory. To borrow a phrase from the ever-wise Dr. Laura Kastner, she is a good-enough mom. She is un-cynical and deeply happy, devastatingly witty, loving and supportive, and 100-percent engaged. She is her daughter’s biggest fan, even as she holds her to high standards. And with her dream job (running a historic country inn), her wicked sense of fun, adorable wardrobe, complicated relationship with her own parents and interesting dating life, she is also a role-model for single-mom happiness. Or really, any mom happiness. Single or not, a generation of mothers bonded with their daughters over Gilmore Girls. Watching the show together was like an awesome girl-power party. It gave moms and daughters a sense of connection, comfort, self-forgiveness and humor that all of us need, regardless of our challenges. I’ll bet more toenails have been painted and cookies have been baked while watching this show than any other in history. I’ll bet moms and daughters planned girl getaways during commercials. Finally, we said to each other, someone who shares our love of Pop-Tarts, Sephora and girl bands with killer drummers! And for us single moms, finally, a role-model mother-daughter that is not walking wounded in search of a man. You don’t have to be a single mom to cherish this show; many of my happily married friend and their daughters love it, too. But in many ways, my daughter and I lived it. When the revival was announced last summer, we couldn’t have known how desperately in need of comfort we would be this November. My daughter will be home from college for Thanksgiving, and we’ll watch together, probably in one long afternoon, curled up under blankets once again. “Where you lead, I will follow” we’ll sing to each other as the credits roll. Like any good comfort food, you don’t have to need it to love it. But in trying times like these, it’s exactly what we need. 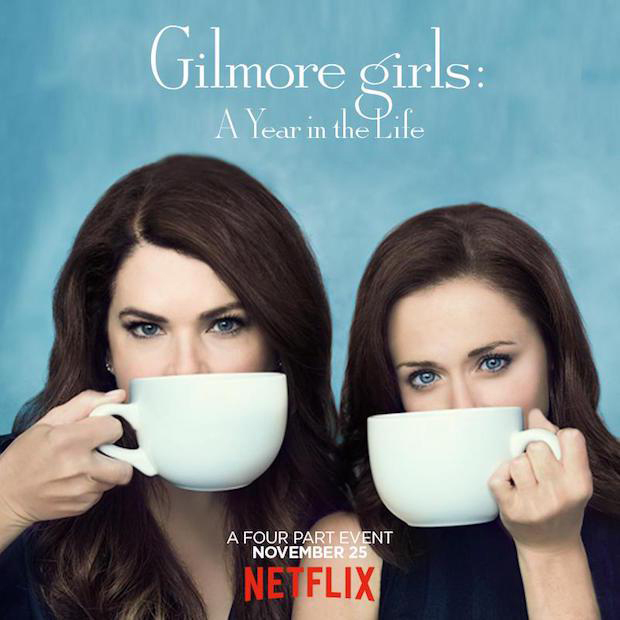 Gilmore Girls: A Year in the Life will be released on Friday, Nov. 25, on Netflix.